CONGRATULATIONS to Michael Mello, the Rotary Club of El Dorado Hills Student of the Month. 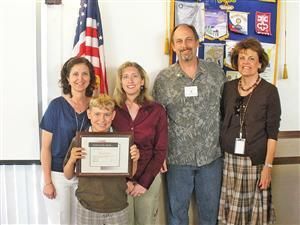 Rotary honored Silva Valley Elementary student Michael Mello Student of the Month. "I cannot wait to see what he becomes when he's older," said teacher Gwen Sigrist said. She called Michael "compassionate" and a"good leader. With Michael are, left to right, Silva Valley Principal Kathy Holliman, teacher Gwen Sigrist, Rotary Club President Bill Tobin and Buckeye Superintendent Terry Wenig.